ViewSonic Digital Picture Frame VFA724w-10 (Model: VS13471). Digital Photo Frame is a very simple thing. After a while it becomes boring and it is a time to see what's inside. Actually I needed a screen for Raspberry Pi, and wanted to see whether it is possible to use the frame for this purpose. Looking ahead I like to say that it did not happen. 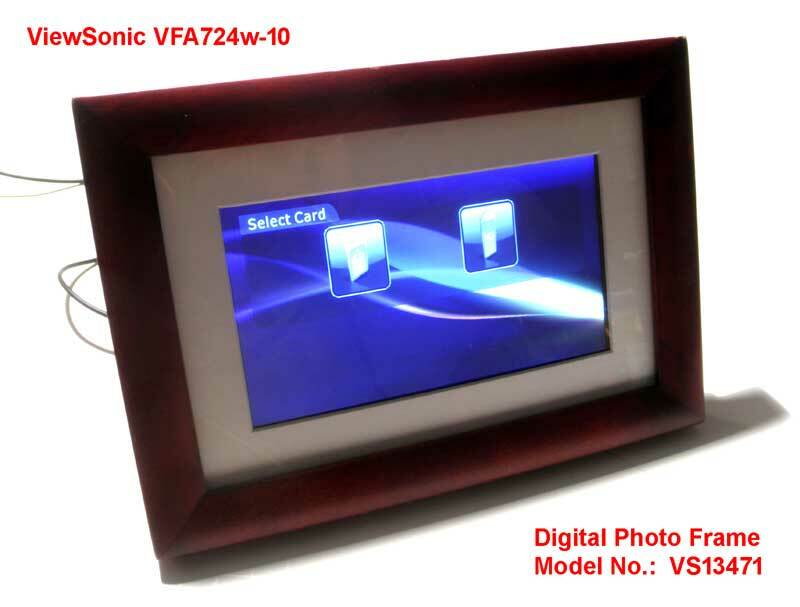 7" Digital Photo Frame ViewSonic VFA724w-10, model n.:VS13471. Fine-looking frame, continues to work for many years. No problems at all. And it is a time to see that in the middle. And there's no surprises. In the middle of a motherboard on which the processor memory and multiple power suppliers. Top view on the photo. Real time clock IC (RTC) is missing, together with a battery and 32 kHz crystal. HV connector provides 11 volts to Back light. Find documentation on CPU - failed. Pin out of AML6210A - on the picture. The bottom side of the motherboard was more interesting. 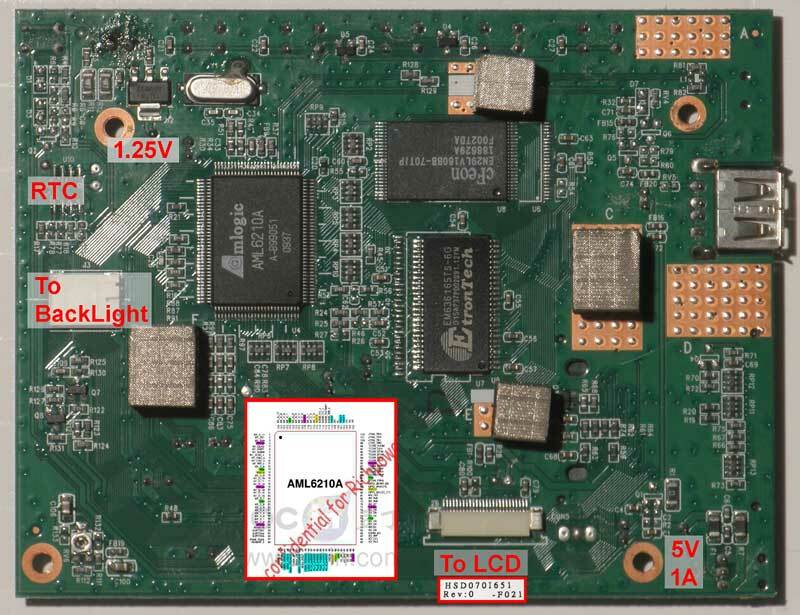 Two USB connectors (on the board and missing one) in parallel. IR sensor and 'something' with a question mark, are missing. No hidden serial port on the board, but JTAG is ready to go. TP1-4 connected directly to AML6210A. In addition, TDI (TP4) is tied to 3.3 volts through 4.7k resistor. In conclusion, it is no easy way for that would transform it into something else. 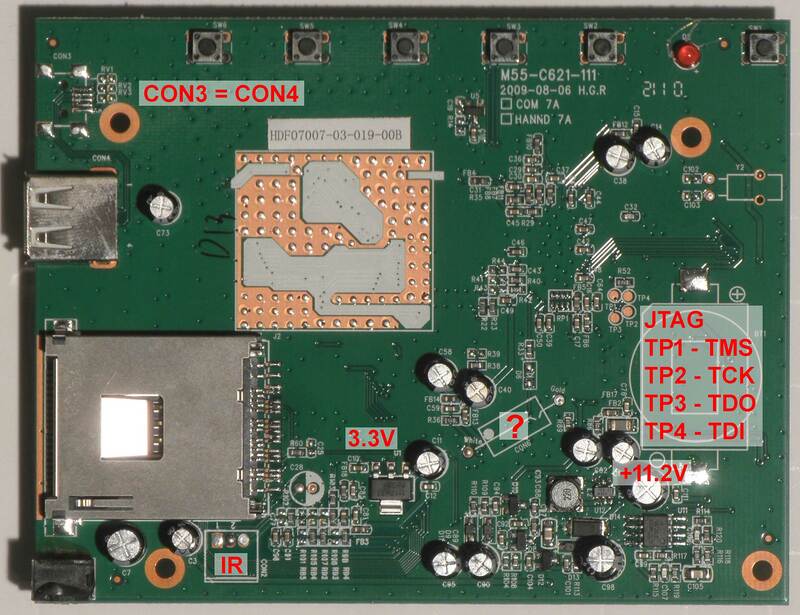 Even with new software (reprogram FLASH by JTAG), it will remain same Picture Frame. Lack of interfaces does not allow to move on. And the good news is that you can use information on the pictures for future repairs. then let me know. E-mail is highlighted below.